Every Black Friday, the ugliness of capitalism is laid bare across the country with hours-long lines and throngs of customers trampling each other. But the usual rigamarole pales in comparison to the 1983 holiday season, when Americans went to war over Cabbage Patch Kids. Store managers tried to curb chaos by stocking the dolls in the front of the store. But as soon as they paid, customers were afraid to face the throngs pushing through the doors, spilling from the parking lots. People ripped boxes from strangers’ arms without a second glance at the style of doll itself. One man even flew to London to buy a doll for his five-year-old daughter. Harrod’s had received 1,000 dolls but they were gone within hours — “although the customers queued quietly, to be sure.” Scalpers were reselling the $25 dolls for $150. At the same time, knockoffs called Flower Kids were pouring in from overseas. Sometimes the only way to tell the difference was by the lack of bellybutton. On December 1, 1983, despite wind gusts of 37 miles per hour and a wind chill of -7 degress, two dozen people showed up at Milwaukee County Stadium, the Associated Press reported, after two radio show hosts joked that a B-29 bomber would drop thousands of Cabbage Patch dolls from the sky. 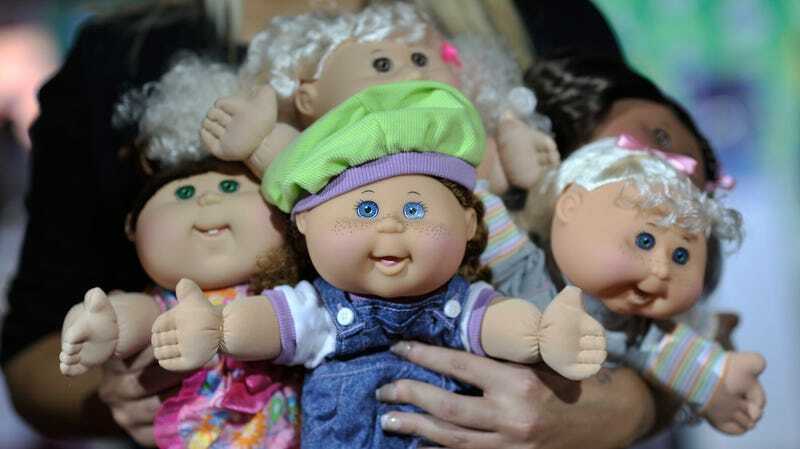 Cabbage Patch Kids remained a cultural icon for years: In 1985, the U.S. sent a Cabbage Patch Kid to space, and in 1992 the doll became the official Mascots of the 1992 U.S. Olympic Team. They even appeared on commemorative stamps that celebrated the 1980s. Though the obsession with Cabbage Patch Dolls is perhaps now long-forgotten, consumer mania and the forces that drive it are age-old. Dern and Rae’s show aims to “explores class, race, privilege and what it takes to be a ‘good mother.’” This is gonna be good.